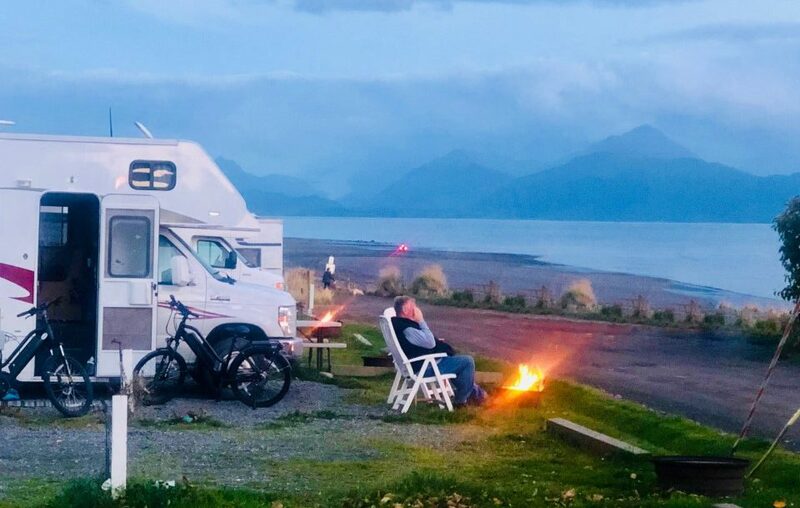 The RV Park is centrally located in downtown Homer, on the bluff, above Bishop’s Beach, just one block away from the Homer Visitor’s Center and Chamber of Commerce. Our guests enjoy a convenient, intimate setting, peaceful walks along the beach, nearby museums, art galleries, restaurants and a coffee shop. And best of all – you’ll enjoy mountain and ocean views from our RV Park in Homer, Alaska. Water and Sewer: While our showers are complimentary; please help us conserve water by limiting your showers to less than 15 minutes whenever possible. Washing your vehicles, motorhomes or trailers is not allowed in the RV Park. We recommend the local car wash for this. #3 – #11 are ‘drive in’ for motorhomes (although trailers are permitted) to maximize the view of Kachemak Bay.